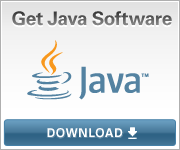 Any computer that can run a Standard Java Runtime Environment can run Jacksum. See also the system requirements for the JRE. In order to run Jacksum, you need a Java Runtime Environment (JRE). You can get it for free for your platform/operating system. It is required to have at least the JRE version 1.3.1. However, it is recommended to install JRE 8 or later. For Windows, Linux, Mac OS X and Solaris please click on the icon below. For other operating systems, please ask your operating system vendor for a suitable JRE. The integration of Jacksum is supported by an installer for the following file browsers/file managers: Microsoft's Windows Explorer, Apple's Finder (Mac OS X 10.2+), and on Linux/Unix those are Dolphin, Konqueror, Krusader, Nautilus, ROX-Filer, Thunar, Xfe and many more. In addition to the disk space requirement by the JRE, it is required to have not more than 1 MB diskspace for Jacksum. You should have at least 128 MB physical memory installed, see also the system requirements for the JRE.